"The Wall of Sound" section presents 11 tracks by eight artists. They include From the Edge of Saturn by the Australian sound artist Jay-Dea Lopez; We are the Night Family by the Greek sound artist Konstantinos Fioretos, written for four tubas; the innovative and creative Vietnamese composer Minh Pham Quang Tran continues to discover and experiment with new styles in his track Dogma; Jatin Vidyarthi from India focuses on ambience, mood and atmosphere in the two tracks aM I hEre and HuMid; Snorkel Quintet from Spain (Carlos Edelmiro Pechant, Gabriel Millán, Oscar Durán, Diego Caicedo, Martin Del Litto) explores silence in their composition called Las Discretas. The tracks in the Wall of Sound section will be published later this year on a CD in the MUU FOR EARS series. The earlier MUU FOR EARS CD compilations no. 1–9, published in 2009–2012, will also be available in the Invisible Time exhibition. The MUU FOR EARS compilations have already published sound art by 71 artists or artist groups from 14 countries. The artists for the Invisible Time exhibition were selected through an open call for submissions process. The call for proposals was published in February 2012, and 406 applications from 39 different countries were received by the end of the deadline. 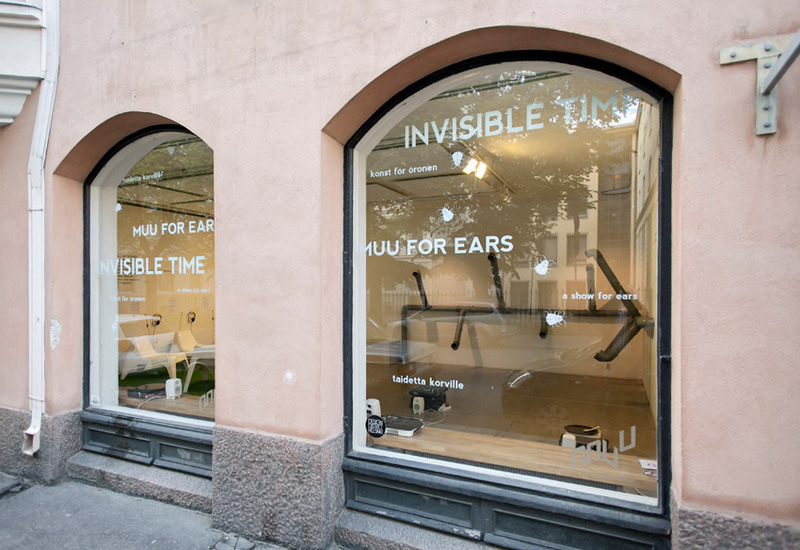 The exhibition is part of Audio Autographs, the international sound art project of Artists’ Association MUU. The main supporter of the Audio Autographs project is Nordic Culture Point. The project comprises workshops, lectures, CD publications and events which have in 2009–2012 also been supported by the Finnish Promotion Centre for Audiovisual Culture AVEK, Frame, Konstsamfundet, Finnish-Norwegian Cultural Institute, Finnish-Norwegian Cultural Foundation, Swedish Cultural Foundation in Finland, and the Arts Council of Finland. Produced by Artists' Association MUU. Curated by Rita Leppiniemi and Timo Soppela.